My sister in law taryn threw the sweetest party for my little niece cortney last night, complete with miss muffet’s face painting. 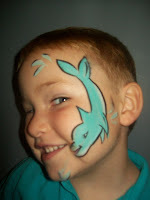 my big boys chose scary faces and the littlest one kept lining up for more, seriously by the end he had mirrored dolphins on both sides of his face, and flame tattoo sleeves up his arms. (let’s not try to look too far into the future with that ;) I saw a few adults twitching after hours of party horn blowing by the too-many-to-number kids, but then they tucked into the buffet and all was well after that. I like your day's Rx! If I were Canadian, we'd def have to hang out!